Late Monday, the Buffalo Sabres announced they have traded forward Nicholas Baptiste to the Nashville Predators for right-shot defenseman, Jack Dougherty. While not a headline-making splash of a trade, it’s yet another move by Sabres general manager Jason Botterill to revamp his team. Dougherty, a second round in 2014 (51st overall), has skated the last two seasons with the Milwaukee Admirals of the American Hockey League, the Predators’ farm team. The 6-foot-1, 186-pound, 22-year-old blueliner has appeared in 141 regular season games and three playoff games with the Admirals. Before that, he played 68 games for the Portland Winterhawks in the WHL, tallying 11 goals and 41 assists. Last season, Dougherty struggled mightily. His point production fell 12 points and he registered a 1.82 goals-for per 60 minutes while giving up a 3.21 goals-against per 60. He carries a $695,000 cap hit this year, the final year of his entry-level contract. He has yet to skate in an NHL game. 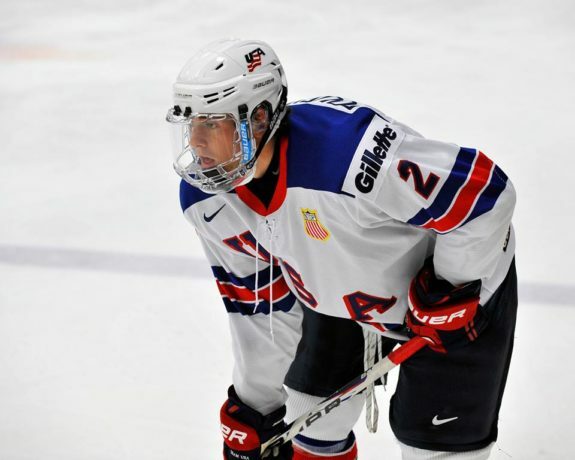 Dougherty had four points (two goals and two assists) in seven games as a member of the United States team that won the gold medal at the 2014 IIHF World U18 Championship. Baptiste, is a 2013 third-round pick by the Sabres. The 6-foot-1, 205 pound, 23-year-old right wing had a career-high four goals and two assists in 33 games with the Sabres last season and notched seven goals and 11 assists in 36 games for the Rochester Americans. As a restricted free agent, he signed a one-year deal this offseason for $787,500. In 47 total regular season games with the Sabres, Baptiste had seven goals and three assists. The Ottawa, Ontario native’s strength has always been his speed. His weakness has been his defensive zone play. In training camp, he stressed that he wanted to be someone that the coach can trust defensively. He worked on board and wall battles and transitioning from his zone. Baptiste never developed into the scorer the Sabres envisioned when they drafted him. He will likely max out as a bottom six forward at the NHL level or a top six forward at the AHL level. On the surface, this trade looks like a marginal forward for a marginal defenseman. Baptiste had just cleared waivers and was pegged for Rochester. Had the Predators plucked him off the waiver wire, they would have had to add him to their NHL roster. Now, they can assign him to their AHL affiliate. After considerable hype, Dougherty’s development has taken longer than expected. Had he stayed with the Predators, he would have needed to take a big step or else he would’ve fallen even further down the depth chart. His projections have him no higher than bottom-pair defenseman. The Sabres are shoring up their thin defense, especially on the right side. Baptiste struggled to find consistency. He can skate like the wind, but can be a liability in his own end. It appeared as though there wasn’t a future for Baptiste in the organization. At most, he was destined as a third liner. He was given plenty of opportunities to make the Sabres, a team that’s been terrible since he was drafted. He never seized the moment. Even with all the increased competition for final roster spots in the Sabres lineup, Baptiste was hoping to crack the roster this year. This offseason, Sabres General Manager Jason Botterill brought in Jeff Skinner, Conor Sheary, Tage Thompson, Patrik Berglund, and Vladimir Sobotka. The GM is clearly on a mission to turn around his last-place team. Both players’ time had expired with their organization. In the short term, the Amerks lose a top forward, making it a bad deal for them. Their gain is another right shot defenseman who, if he can up his game, fills a much-needed role for the franchise. Both players will be restricted free agents after this season. Sometimes players need a fresh perspective with new scenery. This looks like one of those trades that doesn’t move the needle much in either direction. Baptiste and Dougherty could flourish on their new teams with new teammates. Time will tell, but for now, it seems like a fair deal for both sides.